Try our Hiddenite Facet Rough Satisfaction Guarantee - compare our prices and our superior quality. This very rare size & fine quality green kunzite crystal (also known as hiddenite) weighs 4.5 pounds! It actually is bi-color, having very intense golden-lime color at one end with deep green color at the opposite end (100% natural colors), and it has large areas with superb transparency as shown in the photo at left, with many facet-grade areas in its interior. 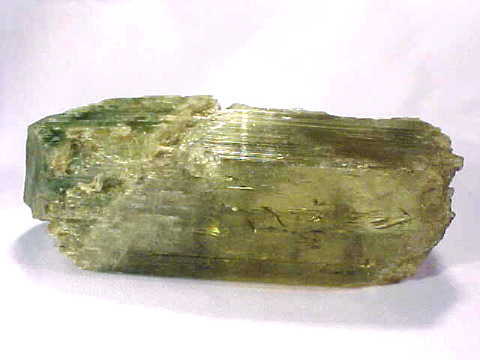 This spectacular golden-green spodumene crystal is also naturally terminated at each end (referred to as being bi-terminated). See also a back-view photo. This is the end of our Hiddenite Facet Rough virtual gallery page. To see more hiddenite photos, just select another item category from the table below. To see photos of another mineral variety, select any item category link in our Mineral Inventory & Factsheet Index. Would you like us to inform you when we add more natural hiddenite facet rough on this page?